Ensign Paul Sinclair has been assigned to the orbiting, military spacecraft, USS Michaelson, as its sole legal advisor. But when the ship's captain faces court-martial following the destruction of a civilian research vessel, Sinclair finds himself defending a doomed officer. 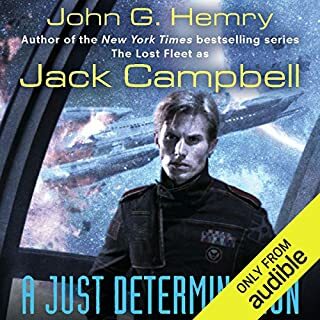 Would you consider the audio edition of A Just Determination to be better than the print version? What was one of the most memorable moments of A Just Determination? While the military law and court martial sequences are not perfect (says this former JAG lawyer), they were quite close and give the real gist of the way that military law works. Of course, like all authors, this author skips over the proper introduction of evidence and allows the witnesses to make speeches and give lots of opinion, but that simply makes the story move along and maintain the tension. Overall an excellent read.